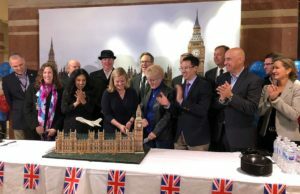 Two weeks ago American Airlines launched a new nonstop service flight from Phoenix to London. Thanks to our strong partner, American Airlines, I was honored to participate in the inaugural trip as a member of a delegation led by former Mayor Thelda Williams from the Valley to London with other Valley leaders including Glenn Hamer with the Arizona Chamber of Commerce and Industry and Chris Camacho of Greater Phoenix Economic Council. Leading up to our departure, we were honored to be joined by the newly elected Mayor of Phoenix, Kate Gallego. Mayor Gallego understands the importance of securing additional international flights for our economy. We look forward to working with Mayor Gallego to secure new international routes to and from Phoenix Sky Harbor International Airport. The opportunity to fly to London on American Airlines’ inaugural flight from Phoenix was eye-opening. The ten-hour flight was seamless. From the quality customer service at Sky Harbor to the welcoming flight attendants, I was quite impressed by the experience. And, I know that this quality of service will reflect well on our city as more and more business travelers choose Phoenix and American Airlines for a direct connection to Europe. 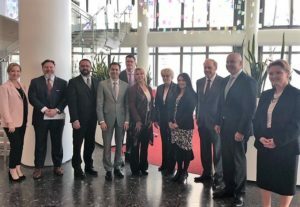 During our time in London, the delegation had the opportunity to meet with U.K. business and government leaders to deepen our ties with one of Arizona’s most important trading partners, and it’s third-largest direct foreign investor, representing nearly 14,000 Arizona jobs. There was substantive discussion ranging from the potential impacts of Brexit, to trade talks between the U.K. and the United States, with a potential role for Arizona as talks continue, and new investment in our region by British companies. 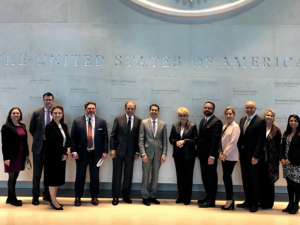 There is no doubt that the connections made during this trip will yield significant dividends in the months and years to come in the form of additional investment in Arizona and new trade opportunities. This flight means net new jobs for Arizona and a direct connection to one of the most important financial and cultural centers in the world. The new nonstop service flight will run daily and highlights that Phoenix Sky Harbor International Airport is transforming into a vital international hub for U.S. travel. According to research completed by Seidman Research Institute, W.P. Carey School of Business, and Arizona State University, nonstop international flights at Sky Harbor result in $3.4 billion of total economic impact to our region. As a staple in our community, Sky Harbor supports our region’s economic prosperity. Our airport directly supports $12.3 billion of economic activity, safely transports approximately 120,000 passengers daily, and with more than 100 domestic flights and 22 international destinations provides more than 57,000 jobs to residents. This new direct international connection to London underscores American Airlines’ commitment to the Greater Phoenix region and the importance of Phoenix as a hub city. A special thank you goes out to Joe Hughes, Regional Director of Government Affairs for American Airlines in Arizona and Rhett Workman, Managing Director, American Airlines at London Heathrow for making this trade mission a reality and for their strong support of a direct link from Phoenix to Europe. Additionally, I would like to recognize Jim Bennett, Director of Aviation Services at Phoenix Sky Harbor Airport, along with Deborah Ostricher, Assistant Aviation Director and the rest of the Sky Harbor team for the incredible about of time and energy they dedicated to bringing this flight to Phoenix. The Greater Phoenix region is continuing to grow and expand. It is important that our airport supports the needs of the business community and that airlines continue to see value in expanding their footprints at Sky Harbor. And, it’s equally important that we support American’s new direct flight to London by voting with our wallets and filling those seats across the Atlantic so Sky Harbor and Phoenix can continue to move at the speed of business across America and around the globe.